For many people, the term "tree removal" brings to mind big, burly men in plaid flannel shirts and blue jeans using a chain saw. While a chain saw is most definitely a choice piece of equipment, there is much more needed for effective, safe tree removal around a business or home. This is one area where you definitely want a professional. 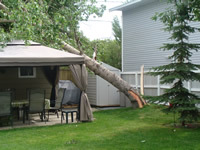 If you attempt tree removal yourself, you may be compromising your safety and the safety of your home as well. When Is Tree Removal Recommended? 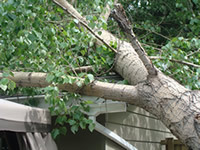 Tree removal is recommended for a number of different reasons. You may want an area cleared of the trees. One may be infected with a disease and may need tree trimming on a lighter end. Others may pose a safety hazard. While the list could go on and on, most tree removal is done for aesthetic reasons. When you begin a new building project, you will probably end up having trees removed. 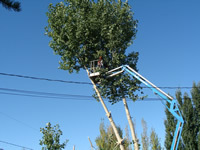 This is a simple task for a professional tree care specialist, especially if there is no standing building in the areas. After the tree is cut down, the stump will need to be removed as well. While this can be done with a backhoe, there is now special machinery that can easily handle the task. The hole is filled in and leveled off, preparing the area for the construction to begin. Tree Removal for Safety Reasons. When a tree is removed in a tight space, such as next to a house, other buildings, or trees, it takes special equipment and a whole lot of "know how." Many trees must be removed because they are dead or dying and can pose a safety risk. Pulling down these trees can be very dangerous. However, a professional can make the job go quickly. Most of the time, a rope is attached high up on the trunk. If the tree is large, it may take several ropes to ensure that the cut tree falls where it needs to. This is often the most dangerous part of the tree service job. Many times, a tree may have to be removed because it has a disease that could infect other trees if it remains. There are special considerations for removing diseased trees so that the disease is not spread to other trees that are close by. There are a few diseases that will remain in the soil long after the tree, including the trunk and roots, are gone.